Today's featured name is a lovely and truly rare gem in the US: Calliope (Cuh-LIE-oh-pee). The nickname Callie is adorable for this big, strong name. The meaning of this name is "Beautiful Voice." 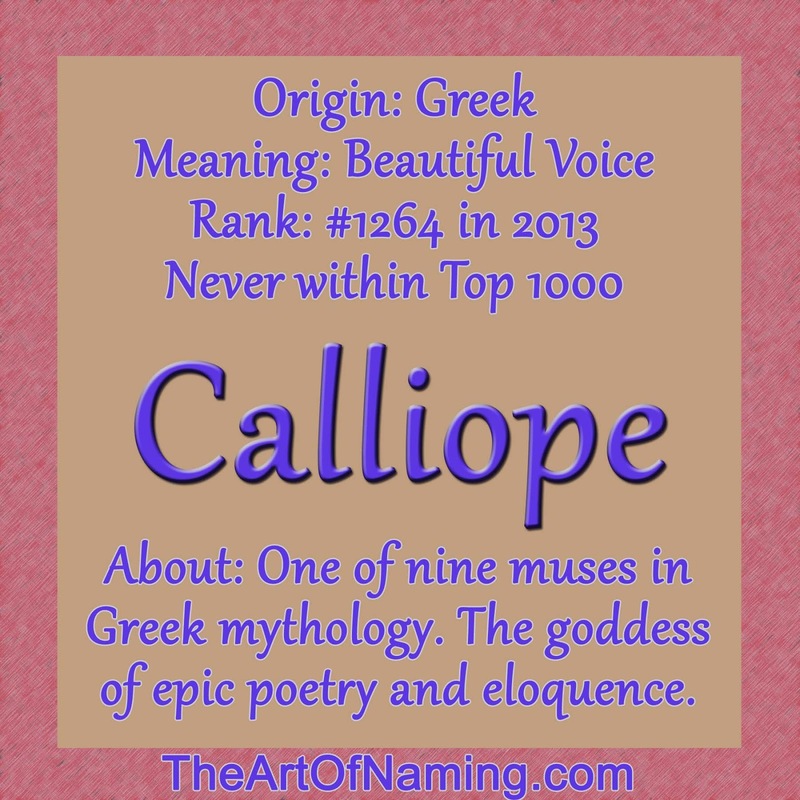 Straight out of the Greek Myths, Calliope was the name of one of the nine muses, inspiring epic poetry. Since this name is so bold and creative, it would be recommended for artistic parents who enjoy literature, poetry and music. Hopefully your daughter will also enjoy these things and be able to live up to the image that this name portrays, namely, a beautiful artistic muse. In the real world, there is an American actress who wears the name, Calliope "Callie" Thorne. In the TV world, there's a Dr. Calliope "Callie" Torres on Grey's Anatomy. The original form of this name is actually spelled Kalliope. The meaning "Beautiful Voice" comes directly from the root of the name: from Greek καλλος (kallos) "beauty" and οψ (ops) "voice". This name is a unique and lovely find! Calliope has never ranked on the US Top 1000 chart at any time between 1880-2013, so your daughter would truly be one of a kind in her school! Although, I have seen the name tossed around baby name forums more and more frequently and the name is on a very slight increase. In 2000, there were only 9 girls named Calliope in the US. By 2013, the number has climbed to 186 births, ranking the name at a record-high #1264. It is gaining a bit more usage every year, but don't expect it to become "popular" anytime soon. If you're looking for an unusual, rarely-used name, Calliope is still a safe bet for the time being. Would you consider using it for your child? Share your thoughts in the comments below!